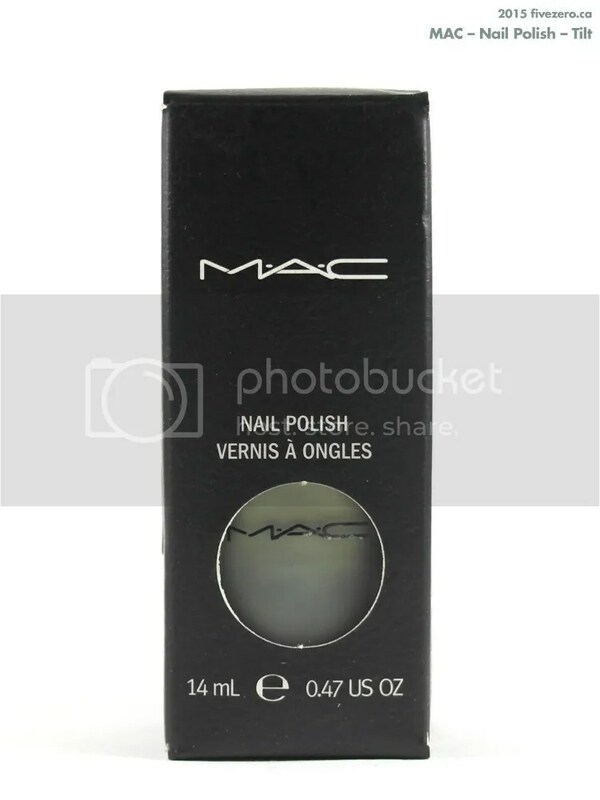 Back in the day, MAC’s frosted square bottles of nail polish contained truly unique and edgy nail colors, and they kind of had to be, because I’ll be honest: the formula was pretty crappy for a mid-priced nail polish! This was long before the days of $50 Christian Louboutin nail polishes, so paying upwards of $8 for a bottle was on the steep side. My very first MAC polish, purchased around the turn of the millennium (I think), was a cool little aqua number called Haze, which I’ll review one of these Thursdays. But I also acquired a few other of the old MAC polishes after they were discontinued—and were thus being clearanced—and Tilt is one of these polishes. Tilt is a blue-green duochrome that also flashes a bit gold. 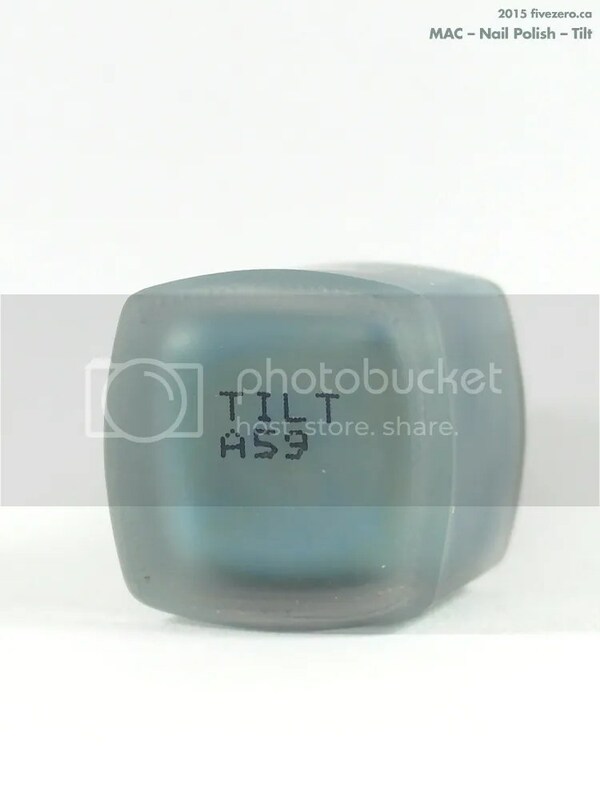 It has a strong, frosty metallic finish. At certain angles you can glimpse a bit of grey-purple flash, but it’s not terribly obvious, and I couldn’t get a shot of it even in sunlight. MAC still offers the eyeshadow version of Tilt, which is pretty much the same awesome duochrome-y, frosty color. I can’t say for sure that I didn’t add some nail polish thinner to this bottle over the years, but regardless, the polish is still in pretty good condition. The formula is frosty, so it does streak a little, and it’s doesn’t give the most even application. It is a bit better than some of the other older MACs I’ve tried, though. Perhaps the frosty finish is more forgiving, in a way. Two coats was required for full opacity, though it could probably use a thin third coat just to get rid of any remaining hints of patchiness. I do wish MAC would bring this color back in their new line of Studio Nail Lacquer, and make that purple flash more obvious. That would be incredible! 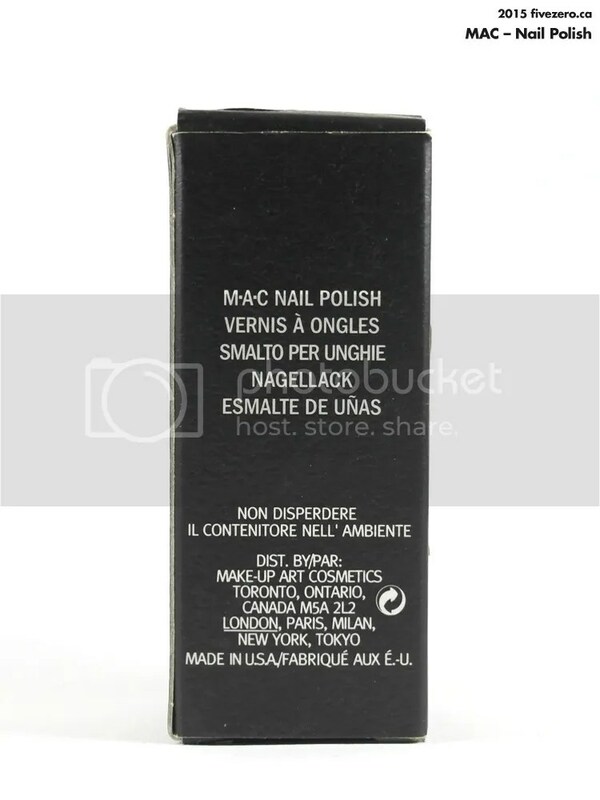 MAC Nail Polish was 14 mL / 0.47 US fl oz. It was made in the USA. MAC Cosmetics (that makes it “Make-up Art Cosmetics…Cosmetics”, doesn’t it?) was founded in Toronto, ON, Canada in 1984 by Frank Toskan, Frank Angelo, and chemist Vic Casale. The company’s products were initially aimed at professional makeup artists; the company now sells products to consumers worldwide. From 1996–98, it was acquired by the Estée Lauder Companies, headquartered in New York, NY, USA. 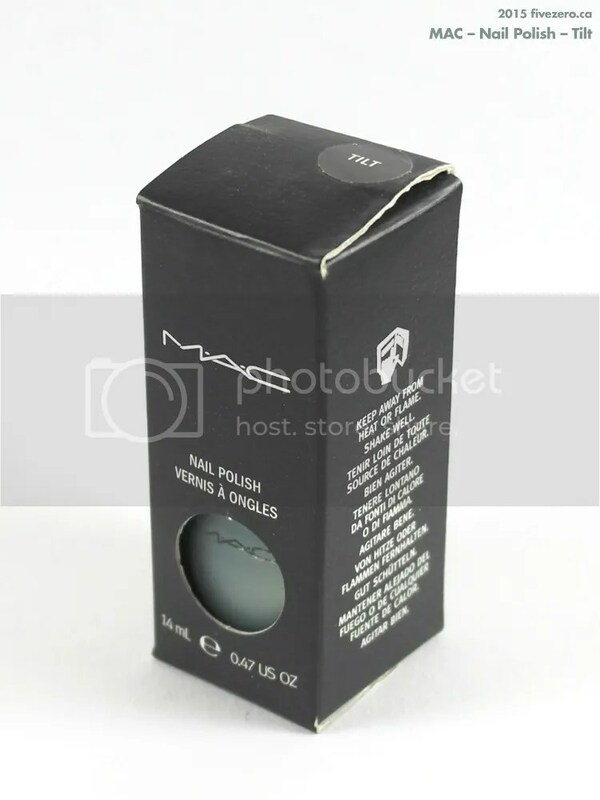 MAC was initially a cruelty-free company; it now states that it is cruelty-free except when required by law. Wow I’ve never seen the old packaging before haha! They have changed it up quite a bit now! I’m another that has never seen this packaging before! But I love this colour, it was actually the colour of my grade 12 prom dress! I wonder if there are any dupes for this that are available now? Oh I love this! Do you KNOW how much money that would fetch on eBay?!! I really like the old packaging, much better than the fat handled ones they have now. Do you remember what you paid for it back then? I actually prefer the look of the new ones, except they are top-heavy which makes them more likely to tip over. DUMB. But the rubberized handles are nice! It looks almost like the big money frost I used to wear! Not a dupe at all. Just reminds me of it. Oh my word, my best friend and I were obsessed with the lipstick that matched Tilt – it was called Haku, I think. It was frosty blue-green-gold, and when you wore it with Spice lip liner (oh my gosh!) it looked pink. What a throwback! 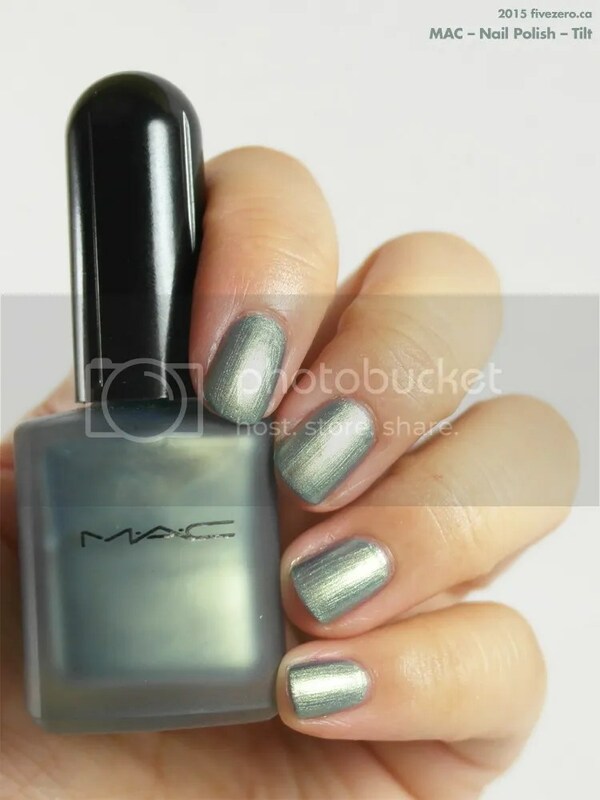 I think I actually owned this polish, too, but I know I never once wore it. What’s up with that? I super like your nail polish haul! OMG!